Microdermabrasion is a non-chemical, non-invasive, enhanced exfoliation treatment that removes dead skin cells and the outer layer cells of the epidermis to encourage the production of new skin cells with higher levels of collagen and elastin. Microdermabrasion improves your appearance and reveals younger, healthier looking skin. Benefits include: clean pores (gets rid of blackheads or white heads), reduced pore size, reduced fine lines or wrinkles, smooth even texture and skin tone, brightens skin, and reduces acne. 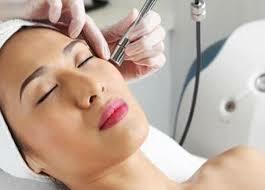 A microdermabrasion facial is very relaxing and restoring. After one treatment you'll feel smoother than ever with your new layer of skin. Enjoy this 45 minute to one hour treatment that includes cleansing, microdermabrasion, a mask, and skin hydration and protection treatment. *The best microdermabrasion in Austin and the best price! Cost is usually $110 or higher per treatment. Yes, you read that right! You can actually get a microdermabrasion on your raised up, uneven, stretch marks. Microdermabrasion works to resurface and smooth out your skin so it's wonderful for treating damaged skin. Stop hating your skin and start loving it.